What’s the best way to eat your veggies? Why, smothered in cheese and bacon of course! I recently came across The Pioneer Woman’s Green Bean Casserole Recipe on Pinterest, and immediately knew I had to try this and make it healthier, and more of a Weight Watchers recipe. The bulk of the dish is green beans, so I just had to make some adaptations to the sauce. Getting the cheese sauce just the right texture can be tricky. You may have to use a bit less of the chicken broth to avoid having it too runny. I suggest slowly adding in the broth, doing a lot of whisking in between. If you don’t use it all, that’s ok. If your sauce is too runny, you can add another tbsp of flour and let it cook a bit longer, while whisking. 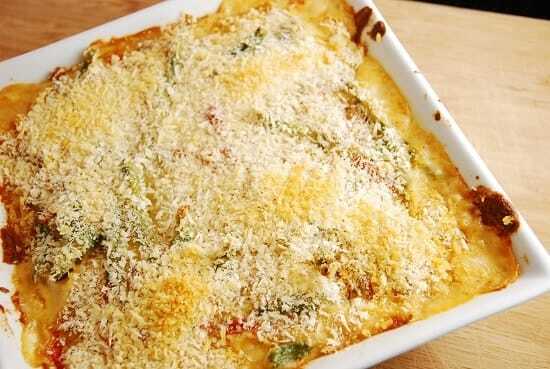 But the end result is an amazing Weight Watchers side dish of fresh green beans, covered in a creamy, cheesy sauce that is highlighted with bacon and pimentos. Oh my gawd, is it GOOD! You can even use this low calorie green bean casserole instead of the traditional version for Thanksgiving. Regardless, this is something you’ll want again and again, and it’s a great way to get those vegetable servings in! A delicious and unique green bean casserole that will delight the whole family! Fresh green beans smothered in a creamy bacon and cheese sauce and spiced with pimentos, this dish tastes way to good to be so light. Blanch green beans for about 3-4 minutes in salted, boiling water. Drain and rinse with very cold water, or place them in a bowl of ice water for a few minutes until they are cool. Drain and place green beans into a baking dish. Spray a non-stick skillet with non-fat cooking spray and set over medium high heat. Cook the bacon pieces for a few minutes, and then add in onion and garlic and continue to cook for another 3-5 minutes, or until the bacon is entirely cooked through and onions begin to become golden brown. Set aside. In a medium sized sauce pan, melt butter over medium high heat. Add in flour and whisk it into the butter. Let cook for a minute or two, then slowly add in the milk and broth, continuing to constantly whisk. While the sauce thickens, which should take about 5-7 minutes. Then add in the paprika, salt, pepper and cheddar cheese, and stir until cheese is thoroughly melted. Turn off heat, and add in the pimentos and the bacons/onions, and stir well. Taste, and season with additional salt/pepper as desired. Pour cheese sauce over the green beans, and gently stir to combine. Top with Panko and place in oven to cook for about 30 minutes, or until sauce is bubbling and Panko becomes golden. I love green beans and green bean casserole is my fave holiday dish…but i’m honestly not even sure what pimientos are! Pimientos are amazing and pretty much a staple in southern side dishes. You should be able to find them by the olives in your local grocery store. I use them in mac ‘n cheese, squash casserole, and deviled eggs. You can even get feisty with your egg salad and trow some in. They are the red middle part of green olives. YUM!